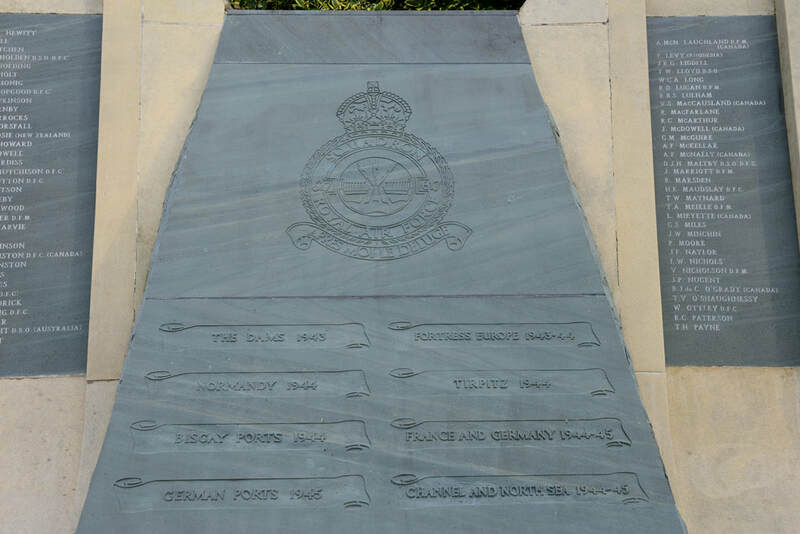 Located in Royal Square, Woodhall Spa, Lincolnshire, the Dambusters Memorial commemorates members of No 617 Squadron who lost their lives in World War Two. The memorial was erected in 1987 and stands on the site of the former Royal Hydro Hotel and Winter Gardens which were destroyed in a Luftwaffe bombing raid in 1943. Shaped to depict a dam the memorial features a slate slab which represents water flooding through a breach, upon which the Squadron's crest and battle honours are engraved. The most famous operation undertaken by No 617 Squadron is without question the Dams Raid, which took place over the night of 16/17 May 1943. The raid utilised Barnes Wallis bouncing bomb and was led by Wing Commander Guy Gibson flying specially modified Lancaster bombers. The operation succeeded in breaching two dams, the Mohne and the Eder, both located in the Ruhr Valley, but at a cost of eight Lancasters, with fifty three of the participating crew being killed and three becoming POWs. The Squadron also undertook many other raids through to the war's end, losing a further one hundred and fifty one crew. 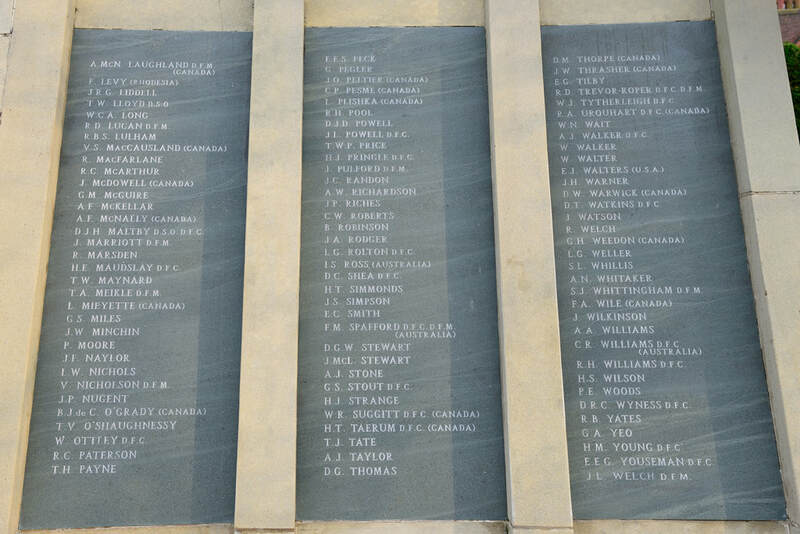 All of those lost have their names engraved on the memorial in alphabetical order with no ranks detailed, but with individual decorations listed. Woodhall Spa is a popular place for visitors and many will walk up to the memorial to look for the famous names, but it should be remembered that most of those listed, who paid the ultimate price, were just ordinary people doing a job and trying to survive. 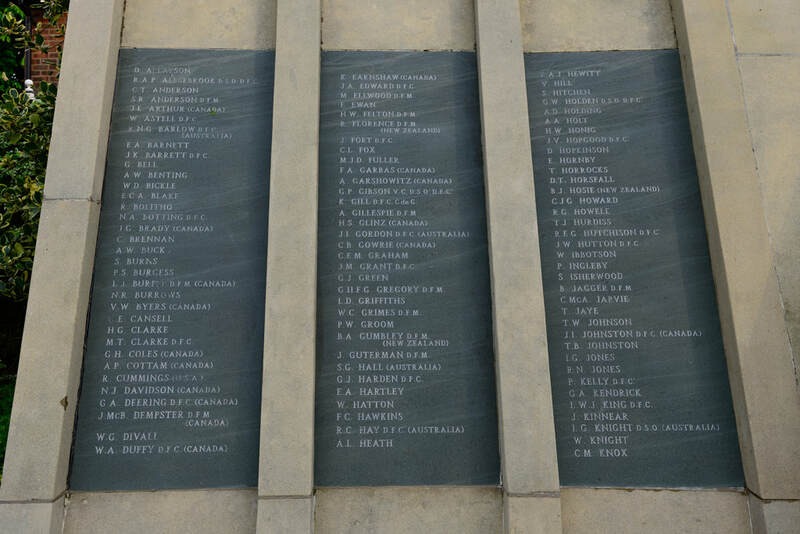 As its states across the top of the stonework of the memorial "They Died For Your Freedom". 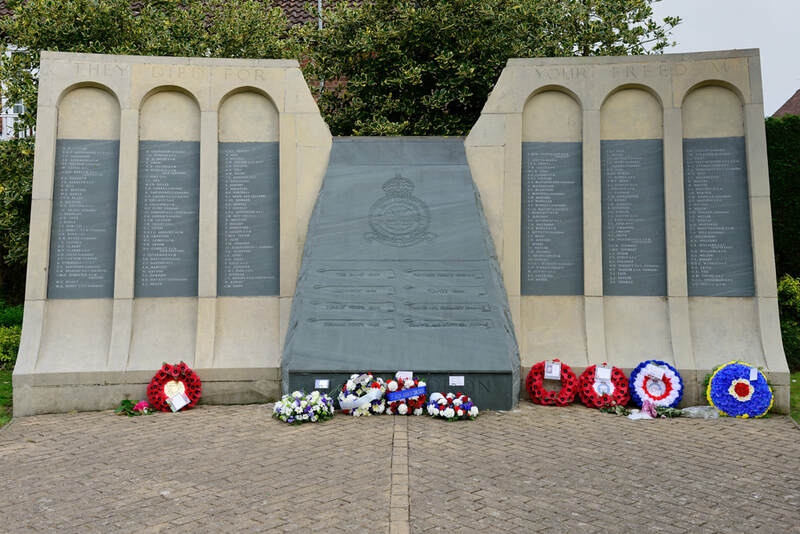 Recently a new memorial to No 617 Squadron was dedicated in Royal Square to commemorate members of the Squadron who have lost their lives in service since World War Two.